Twitter: @edu_ivers Some reflections, thoughts and research on Education and Leadership. Ivers, David (1995) Meeting Procedure: How To Make Communication Effective in MANAGEMENT TODAY July 1995. Australian Institute of Management. North Sydney. Description: This paper, published by the Australian Institute of Management, explores the age old question of how can meetings improve communication within organizations. With implications for leaders across the organization, it proposes that a formal meeting procedure is more business like, more time efficient and less likely to convey a confused message in the organizational communications process. This paper was co-authored by Bill Newcomen and David Ivers. 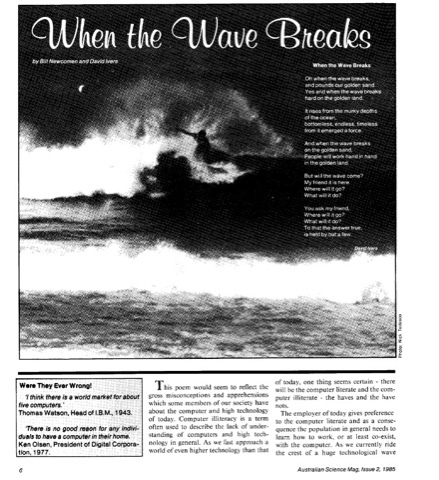 It was published in Australian Science Mag, Issue 2, 1985 by Darling Downs Institute Press, Toowoomba. 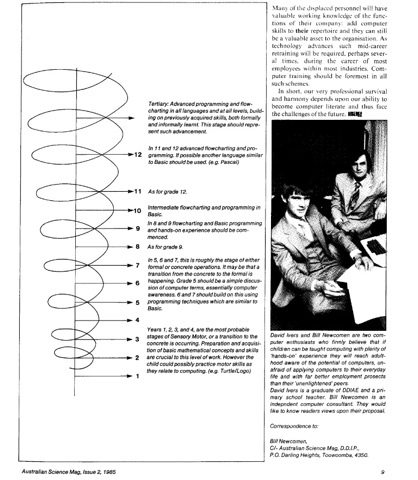 The paper was futuristic in its thinking and orientation, exploring the way forward for Computers in Education, as the 21st Century approached. 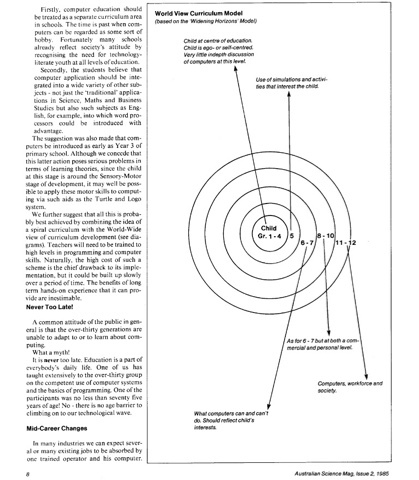 The paper provides a 'Blue Print' for Computers in Education both then (1985) and as Education transitioned to the 21st Century. It anticipated that ICT (Information and Communications Technology) would be regarded as a required skill set in the future. It also anticipates that Programming or Coding would be something for Education to consider in the future. (Whilst Darling Downs Institute Press published the Paper, David Ivers, as one of the authors, has asserted his Moral Rights under the Australian Copyright Act and made a copy of the paper available on his Blog). 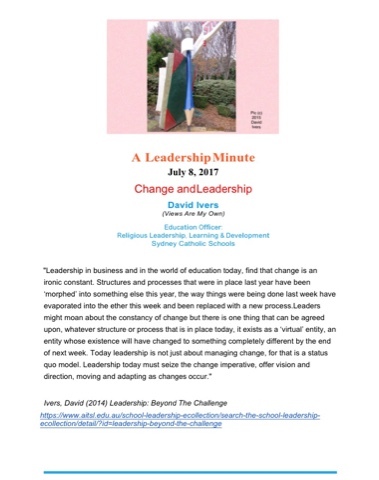 A brief reflection on Change and Leadership via Ivers, David (2014) Leadership: Beyond The Challenge. of leadership. To find out more click here. Alternatively, click here to vist the Australian Institute for Teaching and School Leadership eCollection where you can access and download this paper. The Challenge Of Student Engagement: What Can We Learn From The WorldOf Walt Disney? To Download and Read the Full Academic Paper, Click Here! What Can We Learn From The World Of Walt Disney? For schools, the greatest challenge of the twenty-first century is Student Engagement. Engagement, by its nature always brings the discussion back to Pedagogy. The notion of developing a model of praxis that encourages Student Engagement in the 21st Century, is increasingly necessary. Against this backdrop, this paper seeks to answer an intriguing question. When it comes to Student Engagement, what can we learn from the world of Walt Disney? The answer leads this paper to describe a praxis-based pedagogy, aptly named the "Practice Process Pedagogy (PPP)". For more details, download the full paper as a PDF file by clicking here. To Download The PDF File Of This Academic Paper, Click Here. Organisations, Complexity And The Search For Meaning. Monograph Number 2, April 1998. Reproduction is permitted for study, research or professional development purposes. When used for such purposes, appropriate citation and due credit is to be given to the author. For all other uses please contact the author. The notion that organisations are affected in some way by entropy (see Ivers. D.J. 1997. Managing The Entropic Organisation), gives rise to a most important question. What other implications does the 'new science' have for management? The science of Chaos and Complexity for example, has much to offer the world of management. Managers should be looking at the interconnectedness of events within their organisation, the degree of complexity with which things occur and how this connects in turn to the search for organisational meaning. How does the spacetime continuum impact upon the manager's day? Does it only suggest the need for people in management to be giving freely of themselves to the task at hand? Is this the point at which managers subconsciously, begin to bring 'nomos' or meaning out of complexity? To start to appreciate the abstract forces at work upon the manager daily, to understand what "The Butterfly Effect" coud be for the organisation and how its energy could be harnessed and used creatively, is perhaps the hallmark of a manager in tune with the internal and external business environment, in tune with the self and with the world. By seeing the complexity within the day and within the organisation, the possibility of further life emerges for the organisation, meaning is found in what otherwise might be an abyss, in a rather transforming way. Editorial Note: Where the term Complexity and the term Chaos are used with a capital letter throughout the paper, other than at the beginning of a sentence, then it should be taken by the reader as a proper noun. When used as a proper noun, the terms designate the name of an emerging field within science. Where the term is used with a lower case letter, the term is not being used as a proper noun and is therefore being used in a wider, more generic sense. To Read The Complete Paper, Click Here To Download The PDF File. This Academic Paper may be downloaded as a PDF file by clicking here. For an eBook Version click here. David Ivers.DipT., BEd., GradDipEd(Rel.Ed)., MEdAdmin., MCCEAM., MACE., AFAIM. standards for those engaged by such organisations. Library of Australia and with the relevant State Libraries. ©Copyright 1997 David John Ivers, De La Salle Brothers Marrickville NSW. 2204. Salle Brothers, either as an organisation or individually. than study, permission must be gained from the author. your library catalogue for other titles in the series. including Cosmology or 'The New Physics'. Whatever label people attach to it, one thing is certain. not evident in systems theory as it is applied to organisations. it has merit but is yet to be proven. world in which we live. The upshot of all of this is very simple. must start to question managers at a very fundamental level. be a better approach to the problem! What might the alternative be? In one sense, Paul Davies has partly answered this question. an increase in productivity, especially in relation to costs. some useful guidelines for crossing the chasm of change. people is always the best. of the manager. This is not to suggest that it will be easy. ideas that would be beneﬁcial to the organisation. ones), then they will be encouraged to do the same. than it provides a possible 'fall back' position to work from. renewable systems or modes of organisation create 'entropy'. with high levels of 'entropy' and ambiguity. On this point managers need to be clear. LEADERSHIP CHALLENGE. Jossey - Bass. San Francisco. 4. Adapted from: Kouzes. James.M., Posner. Barry. Z. (1995). UNFINISHED REVOLUTION. Penguin Books. London. P.36. GENERATION. Pocket Books. New York. P. 41. GENERATION. Pocket Books. New York. NEW SCIENCE. Berrett - Koehler Publishers. San Francisco.